This page describes the four permanent panels. The others are shown on the pages describing the main windows to which they relate (see links on the left). The entire control panel can be hidden if desired, to allow the main part of the window to occupy the full width of the screen. This panel provides the most frequently used controls for operating the program. You can choose the tower, the set of bells, and what you want to ring. You can start and stop the ringing and make calls. Solo Go is a feature designed for people who practise alone. When this box is ticked and Start is pressed (to start ringing a method) the program will ring rounds until you join in with your own bell, then ring a few more rounds before starting into changes. This behaviour can be fine-tuned on the Settings panel. The Settings panel contains a collection of assorted options and preferences. The Bell Sounds selection at the top allows you to choose from a selection of bell recordings related to the tower you chose on the Main panel. The default "Twelve Bells" tower also includes a piano and a novelty "Chromatic" option. Users of dumbbells without stays will welcome the Solo Go configuration options. You can instruct the program to ignore a specific number of initial signals from the sensor, which gives you a chance to lift the bell up to the starting position without triggering the normal start behaviour. The Sensors panel allows you to configure and use sensors attached to bells, and control switches (usually operated by the foot). You can define sensors in separate groups - useful for computers that move between locations or for different options within a tower for silent practice. Click on the Configure button to set up groups and the sensors within them. Choose a group from the dropdown list. The sensors it contains will be listed on the panel. Tick the sensors you want to have active. This has two functions: unwanted signals from bells you are not ringing (which may be down and free to sway slightly) will be ignored; and the program maps bell sounds to ticked sensors from the bottom up so that they sound right for silent practice. For simulator usage, sensor detection is automatic. Any of the ticked sensors can be used. Sensors are linked to the bells in the program that you have selected as "user bells" in the order in which signals are received after ringing starts. Other COM-based data interfaces that (unlike Bagley interfaces) do not have the ability to store and apply delays to signals. Belfree and Simbell wireless sensors are in this category, as are custom-built interfaces using (for example) an Arduino. Press the Monitor button at the bottom to show details of all the signals received by the program and how they are handled. This applies to both bell sensors and control switches (see next). Click on the Switches radio button (on the Sensors control panel) and the list of sensors (shown above) is replaced by a list of control switches, shown here (assuming you have defined some). The function that each switch performs is chosen directly on the control panel, via a drop-down list provided for each switch. The same three sensor types defined for bell sensors can also work for switches. 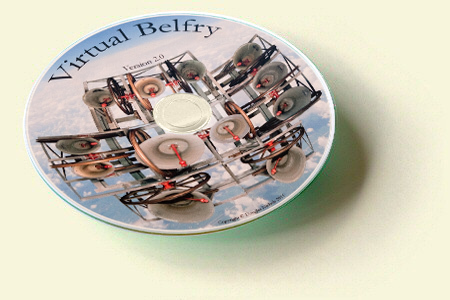 In addition, Virtual Belfry also allows the DigiBee PC control board to be used as an interface for switches. The View panel allows you to turn various features on or off, including the availability of the main windows. Perhaps the main use for this is to hide the Bells window when using the program as a simulator (the Bells window is of little use in this mode and can take a long time to load). It also allows you to move one or more of the main windows into separate windows, so that you can, for example, have the ropes and the blue line windows showing simultaneously. Note that in the image shown here, the options for the Bells window are disabled. Images for the photographic animation of bells must be obtained separately (more about this). The control panel includes other panels, for example the Blue Line panel as indicated in the images above. These panels contain options specific to the various main windows. Tabs for access to these panels come and go according to your choice of main window to the right of the control panel. Windows you have made separate (see the View panel, above) also have tabs for access to their associated controls. These panels are described along with the windows to which they relate (see the links further up on the left side of this page).